Professional, experienced loggers don’t just use any other type of chainsaw they come across to get the job done. Instead, they focus on chainsaws that have higher power, performance, durability, and productivity that matches the large projects they work on.And these pro chainsaws are for the experienced loggers only. They’re built and design such that they can cut in the toughest conditions to give the professional loggers the best experience in their daily jobs.If you’re a professional logger and you’re confused on the type of chainsaw to get your job done, this article is for you. How does an ideal Logger Chainsaw Look Like? As a professional logger, you’d be using your machine all year round. You’ll be using the cutting tool for a variety of tasks such as commercial logging, tree care, and forestry services. This means that you need to find a chainsaw with greater capabilities to endure the massive, tough projects you’ll be working on. Ideally, a logger chainsaw ought to have a durable crankshaft, longer bar length, and even more powerful engine than the prosumer saw. This ensures that they quickly cut and limb through the thicker trees as well as logs. What’s more, with the abuse these pro cutting tools can take, they can easily handle even the most grueling jobs of the professional ax man. There are a few elements that separate the professional grade saws from the others. One feature that sets the loggers chainsaw from the other models is the balanced body design. They feature a long, narrow body layout. The engine is installed in an inclined position, directly behind the bar. This is a critical feature for the saw regarding that you’ll be using it for an extended period. The balanced body will be easier for you to hold evenly, even after long periods of cutting. Chainsaws destined for commercial use are usually top handle models. The chainsaw are compact compared to the rear handle styles- making them more comfortable to control/handle. Due to their lightweight and handle positions, the top handle chainsaw is great at cutting tree branches as well as tree limbs. They also work great in situations where you might need to cut on a downward angle. Most of the commercial chainsaws are accompanied with a commercial warranty that extends to over two years. This is quite remarkable, given that you’ll be using your chainsaw for several hours a day. Such warranties aren’t easy to find- more so on power equipment- due to the demands put on them by operators and owners alike. The warranty will simply give you a peace of mind when using your machine in extreme situations. There’s always a heated debate as to which is the best chainsaw brand for the loggers. Talk to any random loggers, and you’ll discover that 5 of them prefer the Stihl machines while the other half prefers the Husqvarna. Though each logger has their personal preferences, both brands are known for their high-quality, professional grade models that output the best performance in the woods. Choosing what to brand to go with typically depends on your cutting style and preferences. Loggers who use the Husqvarna state that it cuts through faster, allowing them to make a final cut on any tree faster. This allows them enough time to get out of the way. Stihl fans say that they like their chainsaw because it offers low-end torque necessary for powering through the toughest woods without a struggle. The fact remains- both brands design great loggers’ chainsaws. To ensure you pick the right brand, you might consider testing saws from both manufacturers before you buy them. You can do this by just contacting any equipment rental and get the two models. If possible, run each model for a whole day to get a better grip of its performance, features, and benefits. After you’re done testing all the chainsaws, it’s time to make a decision. Weigh the performance, benefits, and features of the two chainsaws side by side. Which one outweighs the other? This will be easy to tell. Depending on your experience with each of the chainsaw and your wood cutting needs, you’ll then be able to make the right selection. Ergonomic engineering and design. Be sure to check for proper ergonomics such as low weight as well as designs such as small vibrations levels in the saw handles, slim, and perfectly balanced body, etc. 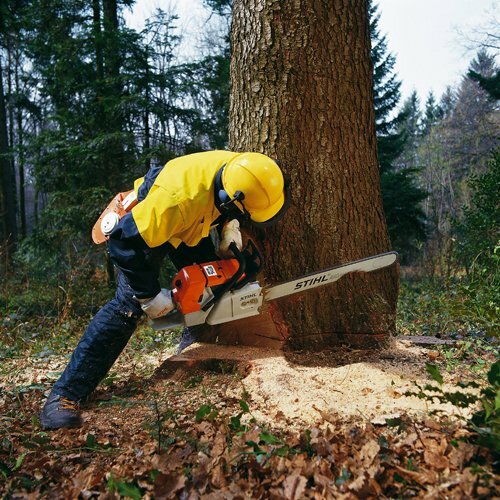 Efficient kickback protection is necessary for any chainsaw for loggers. Pay attention to smaller details such as how easy it is to replace chain catcher stud and easy access to the all the controls. Every logger has their particular preferences when it comes to the right chainsaw to use for the job. Some prefer Pro chainsaws with torque and low maintenance while others swear by the hardiness of the chainsaw. Nonetheless, the most important thing is that the chainsaw does its intended job correctly and safely. If you use a real professional grade chainsaw, you’ll enjoy an increased productivity and even profit.Just like any other chainsaw, make a point of maintaining and repairing your chainsaw regular to ensure its longevity and maximum performance at all times.